Get the grill started first, so it comes up to at least 325°F before you put the bird on. Set the chicken breast-side down and remove anything that’s inside the cavity. Using a sharp knife or kitchen shears, cut down each side of the backbone to remove it. The backbone runs right down the middle of the chicken. When the backbone is removed, the chicken will fold open. Rub the bird with olive oil then rub the spice mix generously all over the bird. 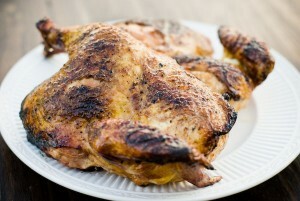 Cook the chicken with the grill lid on, checking and turning the bird every 15 minutes. Watch out for flare-ups and try to avoid letting the chicken come in direct contact with flames. Cook until an internal temperature of at least 165°F is reached. Preheat your oven to 450 ̊F. Lay one parchment paper over another, long side of the paper horizontal. Lay herb sprigs in middle of the parchment. Season fish on both sides with salt and pepper. Lay fish on top of the herb sprigs. 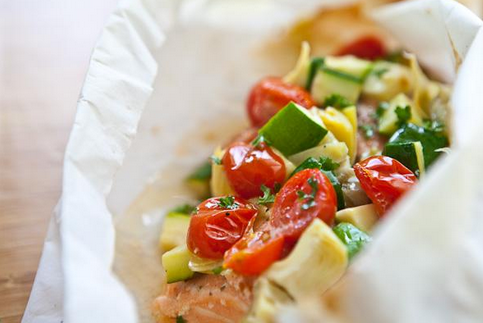 Spoon the zucchini, tomatoes, and artichoke hearts over the fish. Season the vegetables with a pinch more of salt and pepper. Pour the white wine over everything. Seal the packet closed by rolling and crimping the long sides together over the fish and vegetables [Note: A step-by-step video on how to fold the parchment pouch is available here: http://steamykitchen.com/7458-baked-fish-parchment-recipe.html]. Then roll and crimp the ends closed so no steam can escape. Place on baking sheet. Bake for 10-15 minutes, until the fish is cooked through. Timing depends on thickness of fish: 10 minutes for 1⁄2-inch fillet, or 15 minutes for 1-inch fillet. If you are cooking more than one packet, add another minute to cooking time for each additional packet. Just before serving, carefully open the packet (hot steam! ), and add a squeeze of lemon juice over everything. Mix together salt, cumin, black pepper and granulated garlic. Juice the lime over the seasonings and rub the mixture all over the pork. If you love garlic as much as Pat does, you might want to use fresh garlic, too. Optional: use a knife to slice six thin cuts in the pork and push each clove securely inside each cut. You don’t want the fresh garlic to fall out and touch the cooking vessel or it will burn and affect the flavor of the meat. The meat should marinate out of refrigeration for a half hour before you put it in the oven. This ensures that it will cook evenly throughout. If you want to let the meat marinate in the rub longer than this, put it in the fridge for an hour or even overnight. When you’re ready to cook, preheat the oven to 250°F. Place the roast in a pan with one sliced onion and a bay leaf. Cover and roast for three to four hours, or until the middle of the roast reads about 190° and falls apart easily when pulled with a fork. Let the roast rest for twenty minutes or so, then uncover. You’ll notice a lot of liquid at the bottom. Use it as a sauce for the meat, which you will now viciously attack with two forks. It’ll fall apart pretty readily, and you’ll get the idea of the shredding method after a couple of pulls. Enjoy! 2. Cook the bacon and sausage together in a large soup pot or other deep pot. When fat begins to render, add the onion. Sauté until bacon is slightly crispy, sausage is crumbled and cooked, and onion is soft. Add the sliced squash (it may be easiest to add it in several batches) and stir to coat with meat and rendered fat. Turn the heat to high. If the sausage and bacon have not rendered enough fat to cook the squash, then add some butter to the pot. The squash is done once it is slightly browned and there is no liquid sitting in the pot. By this time, the squash will have reduced by about half. Season with your choice of salt, pepper, Cajun seasoning and/or hot sauce. Beat the eggs in a small bowl and pour over the squash mixture. Add the raw shrimp. Bake until hot and bubbly, approximately 30 minutes. Enjoy! Drizzle some olive oil or butter in a frying pan over medium heat. Add red peppers and garlic to the pan. After a few minutes add the spinach and cook until it wilts. Remove from heat. Butterfly cut the pork tenderloin (cut vertically down the middle until almost through, but not quite through the pork). Place saran-wrap over the butterflied pork and pound it as flat as you can without breaking through the pork (use a meat tenderizing hammer for best results). Once the pork is thin, add the ingredients from the pan on top of the pork, spreading it all over. Add the almonds, and optional feta cheese and olives. Gently roll the pork into a tube/roll. If you are using a smaller pork loin, or were not able to pound it very thinly, you may just be folding the loin over rather than rolling it. In this case, securing the loin with toothpicks or kitchen twine will be necessary. Drizzle the pork with olive oil and butter and bake at 375°F for about 40–60 minutes (depending on the size of the pork roll). When the pork is cooked to your liking, let it cool slightly and then slice.